The 2015 Kia Soul has been totally transformed! This urban hatchback is more fun, includes more advanced technology, and is more comfortable than ever before! More, more more! This 2015 Kia Soul was designed to be sleeker and more edgy than the previous generation. Enjoy a bigger, clearer 4.3-inch thin film transistor (TFT) LCD display with Pandora® radio connectivity, an available Rear-Camera Display, and Kia’s available innovative 8-inch UVO eServices system. Turn heads everywhere you go cruising down the streets in an all-new 2015 Kia Soul. The 2015 Kia Soul is available in 3 trim levels: Kia Soul Base, +, and ! The 2015 Kia Soul Base is powered by an efficient 1.6 L Inline 4 engine generating 130 horsepower and 118 lb-ft of torque. The 2015 Kia Soul can achieve an impressive 24 mpg city and 30mpg highway*. The 2015 Kia Soul + and ! have a little more attitude with a 2.0 L Inline 4 engine generating 164 horsepower and 151 lb-ft of torque. The + and ! trim can reach 23 mpg city and 31 mpg highway*. Get behind the wheel and find out why everyone loves driving this fun, iconic, hatchback hamster-mobile! The 2015 Kia Soul continues to do what Kia Soul’s have always done–attract attention from their funky exterior styling. Now, this next-gen Soul gets even better with features including: body-color exterior door handles, body-color bumpers with black inserts, front upper grille (chrome and black matte), dual body-color power mirrors, multi-reflector headlights, privacy glass, heated rear glass with timer, and 16-inch alloy wheels. Find additional features on higher trim levels such as heated outside mirrors, larger alloy wheels, body-color front bumpers with body-color inserts, mirror mounted LED turn-signal indicators, front fog lights, and LED lights. Surprise people with a strikingly stylish 2015 Kia Soul. 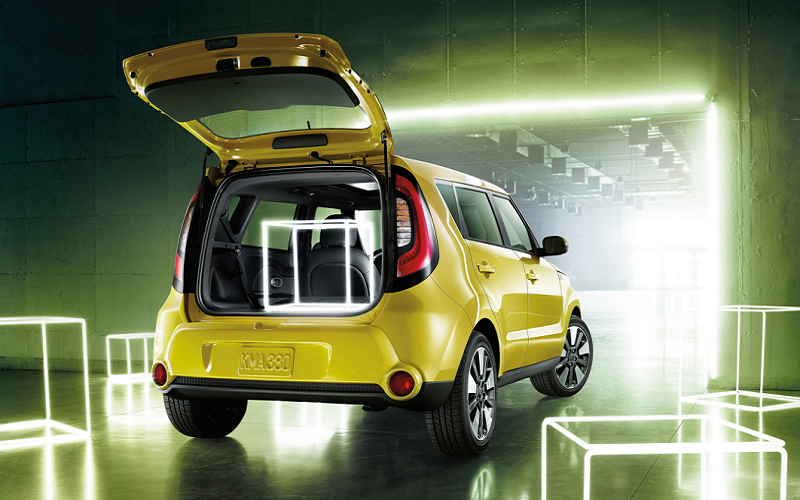 The exterior of the 2015 Soul might be enough to turn heads, but the interior is where it’s really at! Some of the standard interior features include: AM/FM/CD/MP3/SiriusXM audio system with 6 speakers and dash-mounted tweeters, BLUETOOTH® Wireless Technology Hands-Free Connectivity w/steering wheel-mounted controls, steering wheel-mounted audio controls, cruise control with steering wheel-mounted controls, a trip computer, FlexSteer, and remote keyless entry with folding key*. Find even more fun technology features like the UVO eServices system and a rear camera display on the ! trim level. Some of the standard safety features include: Dual Front Advanced Airbags, Dual Front Seat-Mounted Side Airbags, Full-Length Side Curtain Airbags, 3-Point Seat Belts for All Seating Positions, Front Seat-Belt Pretensioners, 4-Wheel Disc Brakes w/ Antilock Braking System (ABS), Electronic Stability Control (ESC), Vehicle Stability Management (VSM), Electronic Brake-Force Distribution (EBD), Hill Start Assist Control (HAC), Tire-Pressure Monitoring System (TPMS), Side-Impact Door Beams, Front and Rear Crumple Zones, Lower Anchors and Tethers for Children (LATCH), Rear Child-Safety Door Locks. Ensure your safety and your passengers safety in one of Kia’s safest vehicles, the 2015 Kia Soul! Stop into Carriage Kia, your Gainesville Kia dealer, and take a 2015 Kia Soul for a spin today!